Microscopic view of a granuloma -- a circular cluster surrounded by numerous small cells with dark purple nuclei (lymphocytes). Sarcoidosis is also known for its potential to effects the eyes and liver. Less commonly, the heart and brain may be affected, leading to serious complications. From the perspective of cells and tissues, the hallmark of sarcoidosis is something called a granuloma. Granulomas are collections of cells that, under the microscope, look very similar to those the body uses to fight off infections such as tuberculosis. Not everybody with sarcoidosis requires treatment, and often it goes away without treatment, but in other cases, it can lead to severe disease. When organ function is affected, for instance, a variety of drugs designed to suppress the immune system may be used. Symptoms may relate to the organs involved in the disease, or there may be generalized symptoms such as fatigue, fever, swollen lymph nodes, and weight loss. Lung involvement is very common and symptoms may include a persistent dry cough, shortness of breath, wheezing or chest pain. Some people with sarcoidosis develop skin symptoms such as a rash comprised of red or darker red-purple bumps. Lymphoma is one of the “blood cancers,” or hematologic malignancies, a term that also includes leukemias and myeloma. Lymphoma is a cancer of the lymphocyte white blood cells. There are many different kinds of lymphoma. Most, but not all, lymphomas start in the lymph nodes. The two broad categories of lymphoma are Hodgkin (HL) and non-Hodgkin (NHL) lymphoma. Both categories have many types and subtypes within, with varying disease features and prognoses. Both Hodgkin and non-Hodgkin lymphoma may affect the lymph nodes of the chest — the area near the heart called the mediastinum. Sarcoidosis also frequently involves this area. For decades, researchers have wondered about the relationship between sarcoidosis and lymphoma. This relationship remains somewhat mysterious even today, for a number of reasons. According to a group of researchers including Ishida and colleagues, “The most common subtype of malignant lymphoma associated with sarcoidosis is Hodgkin lymphoma, but diffuse large B-cell lymphoma, follicular lymphoma, and multiple myeloma may also be involved in sarcoidosis-lymphoma syndrome.” The term “Sarcoid-lymphoma syndrome” was coined to describe these findings. The hallmark granulomas of sarcoidosis are compact, organized collections of immune cells encircled by lymphocytes. 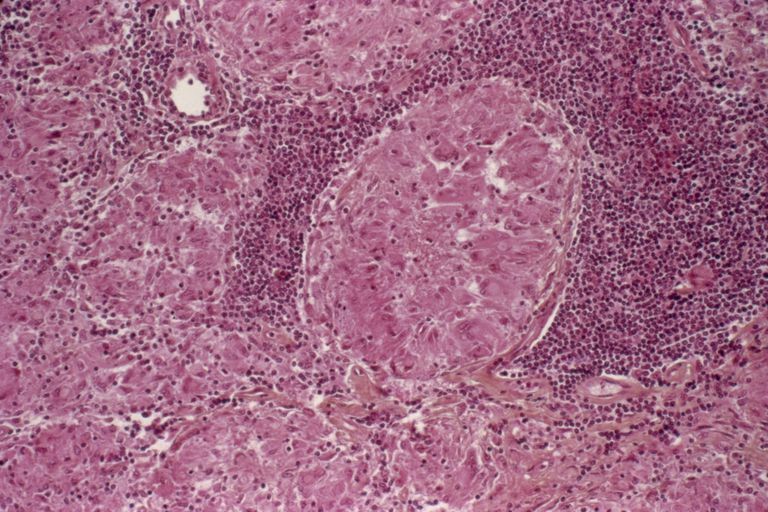 Apparently, lymphomas can sometimes harbor “sarcoidal” granulomas within cancer — and this change, although rare, is thought to perhaps reflect an immune reaction to the cancer tumor, and not the systemic disease, sarcoidosis. Papers published in the last several years have noted that distinguishing between tumor-related sarcoidal reaction and true systemic sarcoidosis may be problematic. Both sarcoidosis and lymphoma have the potential to “light up” on PET scans, adding to the complexity and potential for confusing one entity for the other. Researchers are calling for further studies to refine the clinical applications of FDG-PET/CT in patients with sarcoidosis. In short, many questions regarding sarcoidosis-lymphoma syndrome remain unanswered. Ishida M, Hodohara K, Furuya A, et al. Sarcoidal granulomas in the mediastinal lymph nodes after treatment for marginal zone lymphoma of the esophagus: report of a case with review of the concept of the sarcoidosis-lymphoma syndrome. Int J Clin Exp Pathol. 2014;7(7):4428-4432. Mellemkjaer L, Pfeiffer RM, Engels EA, Gridley G, Wheeler W, Hemminki K, Olsen JH, Dreyer L, Linet MS, Goldin LR, Landgren O. Autoimmune disease in individuals and close family members and susceptibility to non-Hodgkin lymphoma. Arthritis Rheum. 2008;58:657–666. National Heart Lung and Blood Institute. What Is Sarcoidosis? Accessed January 2016. Goswami T, Siddique S, Cohen P, Cheson BD. The sarcoid-lymphoma syndrome. Clin Lymphoma Myeloma Leuk. 2010;10:241–247.